Signing up for an upcoming run at the mall proved to be a good idea. Got freebies and made a new friend – what’s not to like? Starting from March this year I resolved to run at least one race event a month as motivation to keep on running. As I was looking for a race in November, I came across the Live Great Eastern Run (12km) that was to be held on the 4th in the Hartamas district – not too far from where I live and definitely a route I had not yet done. Perfect! 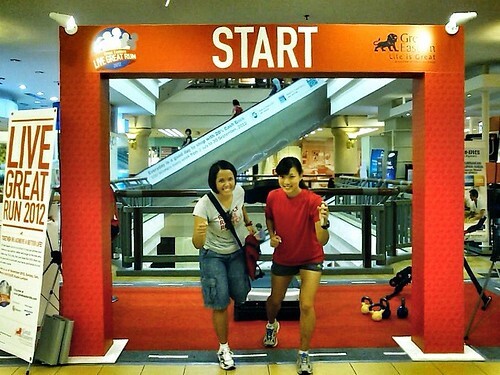 The early bird rate for the run was fast closing that early September weekend and to entice people to sign up on the spot, GE opened a booth at 1Utama Mall with the promise of freebies and access to a personal trainer for running tips. That was enough of a pull factor for me, and so that Sunday I headed out to do my registration in person. To find the booth I had to inquire the mall info counter, and as soon as I knew roughly where it was, it was impossible to miss. There was a mock start line arch setup and just behind it was a treadmill where Karen, the personal trainer on site, was standing. At the time she was alone, so I made it a point to speak to her as soon as I was done. There were not many people around at the time so that was a plus for me. The GE ladies who were behind the counter warmly welcomed me and led me to a netbook set on the table. I began typing my details into the form – only to realize half-way that it was actually hosted on myraceonline.com, which meant I could just logon to my account and all my personal details would be populated automatically. As I’m typing I was asked by one lady to choose my freebie – a towel or a water bottle. I’ve got one too many water bottles at home, also obtained FOC from other events, so I opted for a towel. Thinking I was only getting a hand towel, I was pleasantly surprised to find out later at home that it was a huge bath towel that was plush and of good quality. When I was done registering, I went over to the treadmill and started chatting with Karen Siah, a personal trainer from Subang Jaya with 9 marathon completions under her belt to date who also specialized in boot camp training. She was really friendly and I enjoyed talking to her. I certainly was not shy to ask her even the basic of questions, ranging from nutrition to running tips. The fasting month derailed my ambitious plans to train for my first half marathon in 16 weeks. Now I have less than 2 months left to pick up where I left off (roughly week 3). What would you recommend me do minimally in that short amount of time, given my work/life schedule? I asked. Karen says: Spend at least 3 days in a week to do the following: 1 interval run, 1 strengthening session (e.g. lunges and squats) or cross-training, and 1 LSD run – Long Slow Distance of up to 3 hours, don’t worry about the distance covered, focus more on time spent on feet. Related to the first point, Karen recommended eating apples and oranges every day till race day. These fruits provide good hydration, sugar level and fiber-content. She seemed to swear by this and I have no doubts about the benefits of this practice. Does wearing compression-wear help runners run better because it helps to reduce muscle fatigue? I asked. Karen seems to think it’s a placebo effect and clever marketing at work, it may help some runners to perform better, but others are also content with wearing just regular sports attire and do just as well. I know that wearing the right shoes can positively affect your running gait. But what about people who have different pronation pattern on each foot? Is it possible to find customized shoes in the market for people like that? Karen laughed at my question because apparently her legs are wired with different pronation tendencies too (one was at almost bowl-legged angle and the other was straighter). There was no straightforward answer to this odd question; you’ll just have to find the best fitting shoes for your feet. What do you make of the trend of road races in Malaysia currently? That was my next question. Karen and I both agreed that racing is becoming more popular with each passing month as newbies and veteran runners make a mad dash to participate, especially if the venue was in Klang Valley. Case in point, in 2012 alone – Nike’s We Run KL (which supposedly sold out 10,000 places in less than 6 hours), Adidas KOTR and Putrajaya Night Marathon (both races also had 10,000 slots sold out in a month, before early bird rate period even ended). Karen said that she used to be able to utilize her network of event organizer contacts to have them assign her a slot in a race, but now they make her sign up through their websites just like everyone else, she jokingly said. I’m glad I took the time that weekend to come out and sign up for the Live GE Run in the flesh. In the process, I got to know someone new who knows the inside-and-outs of a sport that I have grown to love in the last year and a half. Thanks Karen for your insights, they were invaluable. 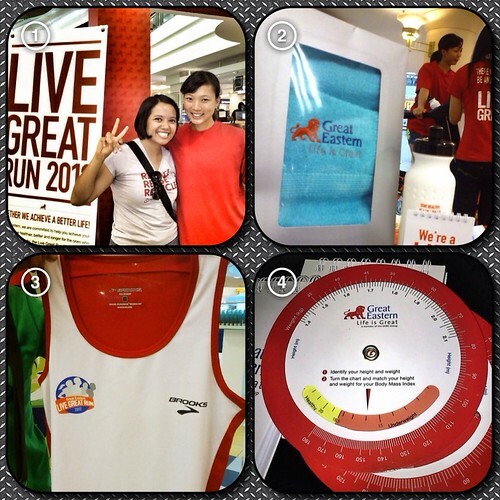 1) With Karen, a cool PT from Subang, 2) freebies if you sign up at the booth (early bird rate ended on Sunday, 2 Sep), 3) the running vest sponsored by Brooks, and 4) a BMI spin-the-wheel calculator thingy.